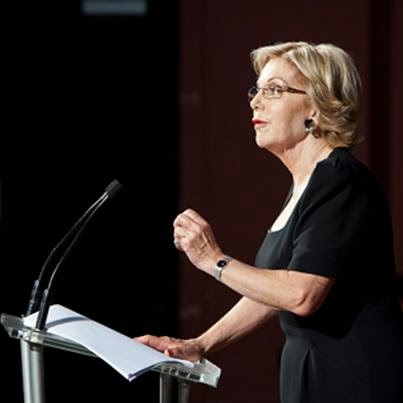 If Ita Buttrose had been a candidate for the leadership of the Australian Labor Party against Bill Shorten and Anthony Albanese, her 2014 Australia Day Address would have been a winner. The 2013 Australian of the Year wasn't afraid to argue for progressive directions nor to use a range of words that we won't hear from the Coalition or some Laborites in the near future. The Australian spirit is also about lending a hand, helping those who need it the most and ensuring that we all get a fair go. ...to believe that in time all Australians will adopt more positive attitudes to ageing, be more inclusive of people with dementia and disabilities and adopt social policies that ensure our country targets the precious resources we have to those who most need them. We find time to celebrate nation building through our military exploits – younger generations learning about the past through Gallipoli and the western front (all of which is a good thing) – but let’s not forget or whitewash the frontier wars with Australia’s first people in the process. In fact, she quotes historian Manning Clark twice. As she mentions later, Ita's not into political correctness, whether it's from the left or right. We need to keep reminding ourselves that social reform and economic responsibility can go hand in hand. It’s not a matter of either/or. I warm to the thought that in the past – in the 1890s and the first part of the last century, and again in the post world war two years – Australia was able to achieve nation building with social reform, and we did it in our distinctly pragmatic way. There is no place for discrimination against people with dementia – indeed against age – in the Australian psyche. I’d like to see the setting up of a national register of scientific achievements so that we could consistently celebrate the phenomenal brainpower that exists in our country. ...achieving greater equality within education and creating a system where education provides opportunities for disadvantaged students must be a fundamental focus if we are to aspire to the Australian dream of a fair go. Ita favours a quota system for women on company boards similar to the one in Norway. One area of inequality, close to my own heart, is opportunities for women. I am struck both by how much we’ve achieved in the last 50 years and how far we still need to go. Her speech came before the announcement that indigenous footballer Adam Goodes is 2014 Australian of the Year but it's a choice that she is bound to strongly support. In no two areas of policy has this been more challenging in our history than indigenous affairs and immigration. We have made progress since federation but we all know that there is more to do. ...we have the capacity to share our country with many more refugees than we currently welcome and I believe we have a moral imperative to do so. For a long time we’ve defined ourselves as an egalitarian society where everyone has a “fair go” in life, regardless of whether they were born rich or poor. Our aim should be to create a society in which we would want to live if we didn’t know in advance whether we would be rich or poor; healthy or ill; whether we might have a disability or not…a society that marries compassion with a can-do attitude. I think that perhaps for this reason, there is a groundswell of grassroots support for major social reform such as the national disability insurance scheme, aged care and education, all of which strive to bring Australia closer to this ideal. The freedom that Australia offers is precious and must be preserved. I finish my 12 months as Australian of the year feeling optimistic about the future and confident that in spite of the challenging times which confront us, we possess the impetus and inherited seed of hope, which I maintain we inherit not just in our genes but from the soul of this great land of ours, to stay true to the egalitarian spirit of our nation. The full transcript is available here or better still listen to the audio.